Read more books! Does the genre matter? With all due respect to Mr. King (my favorite writer, but I am NOT his #1 fan), many people are not reading for pleasure anymore. They are too busy with social media, don’t want to take the time away from another hobby or are just not interested in reading. For those of you who do read on a regular basis, understand you are blessed. I lost my ability to read when I had a stroke. My passion of reading and writing was taken in five minutes. Be grateful and READ! King encourages reading of all types all the time. But this is Horror Selfies. Lynne, sorry to hear you can no longer read 🙁 I myself read on average, 2-3 books a week, and cannot imagine the loss I would feel. I read aloud a book to my husband, who’s eyesight isn’t the best, one a week. I hope you have someone who can read to you. hey Lynne, really have you lost your reading habit? is that possible? Lynne, you may want to look into audio books. My heart goes out to you. I would lose my mind if I lost my ability to read. Some of the Kindle E-readers have text to speech functions though. I know it’s not the same. Christine. Is. My. Fave. Movie. 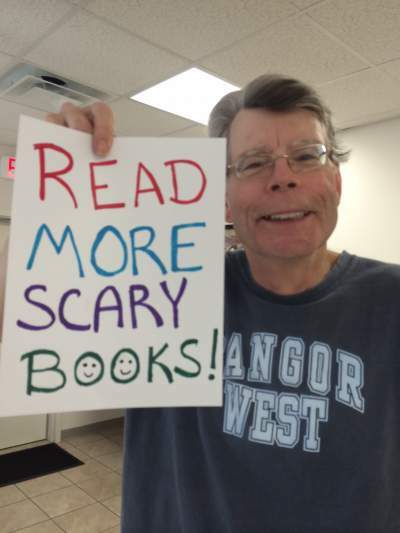 This is a selfie, of course he would say read more horror. I am sure that Mr. King would agree with you on read more books in general. But remember the selfie. Come on take it in the vein it was given and lighten up. Not sure if I should read a greater number of scary books or read books that are scarier- I am planning on doing both! Write more books! Can never get enough books from my favorite artists ! I’ll work for free, pre-reading all your works. …….put down the phone, turn off the computer and pick up a book. If I could I would sneak that poster away long enough to change the cute little smiley faces into cute little shocked expressions. You write them we will read them …. You are the master !!! My son , Grandchildren and myself are all fans ! I have been a huge fan since reading my first Stephen King book which just happened to be The Shining way back in 1979 or 1980. I love them all and would have to admit that I probably am your #1 fan, though I’m no Annie Wilkes (sp?). Maybe someday, with any luck, I’ll get to actually meet you so that you can sign one of my many books. After all, I’m not that far away from Portland, Oregon…or Portland, Maine…JK. Keep ’em coming! LOVE the Bangor West T!! 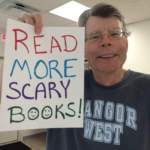 Okay Mr King – write more scary books! i love u! i love the way u write! all hail u! I’m reading “It”, and “Tommyknockers”. Never seen the movie of “Tommyknockers”…. Both are AMAZING! Tommy knockers is a good read. I myself have recently started reading it. By the way, there is a nice little reference to it in tommyknockers, made me chuckle when I came across it. I am waiting for your next book. There are no other authors I care to read. Only those by Stephen King! You write the BEST scary books! im currently reading Needful Things and I LOVE it. Stephen King is the best horror author there is. Horror Rocks, Long live the King!!! READ MORE SCARY BOOKS !! I have a mother who loves reading and encouraged me to read as well. Time to watch the STAND!!! Probably the best training film we have in a viral crisis. What? what to do in a virus crisis. Follow your dreams and hope god nukes the bad guys. The world is a better place with great story tellers like you. You keep writing them, I’ll keep reading them! As long as you keep writing them, SK! love your books first was the stand. Addicted have read every one of your books. Ok. But I prefer philosophy’s books: Stoicism, Epicurism, Ceticism … And fantasy as well: Tolkien, Rowling, Hugo, Alexander Dumas and so on. But ok, King. Obrigado pela dica. Have read every thing written by you, at least 3 X each, some more than that, first one was the talisman, I was 13, reread it at age 23, Made me realize I needed to reread them all. I’m ready “The Dome”… Do you think it is scary enough? I do love it, as all the S.King’s books! The first books that I remember reading were written by you. My dad would read my sister and I bedtime stories and the books I always chose were by you, H.P. Lovecraft, Anne Rice or J.R.R Tolkien. I still fall back to my favorites all the time. In fact, I’m enjoying Doctor Sleep right now. Your books have been a great source of enjoyment for me especially since my dad and I could bond over a love of books and reading. Reading a Joe Hill book right now…… a chip off the old block! If i could, i would do it but I’m a poor reader Mr King, so if you send me all your book collection i would be happy! Hugs from Brazil! Stephen King is an absolute legend I love his books I just cannot get enough of them, I live in Cairns Nth Queensland Australia, my daughter sends me the latest books. The first horror novel i ever read was from Stephen King, Now i can never pick any other author to read!! Hey Steven write more books I will read more books have all your books in hard cover you write them I will read them. So nice to have you along! If Uncle Steve tells me to read more scary books, then I’ll do it, gawdammit. (BTW, I read The Shining when I was like 10 or 11, under the covers by flashlight. Certain images terrified me and I’ve never forgotten them, but I was hooked on horror for life. THANKS, UNCLE STEVIE! Mr. King – I forgot to mention my favorite but inspirational (scary-turned-miracle) The Green Mile. Looks like a week of Halloween Reading Bliss!!!!! Yippeeeeeee!!!!!!ippi!eeeeeeeeeeeeee! Sorry….Well, Happy Halloween To All and READ MORE SCARY BOOKS! ‘Meevo’ – but I grudgingly respect Stephen for his mastery of the horror genre. I am still King of sci-fi, though!